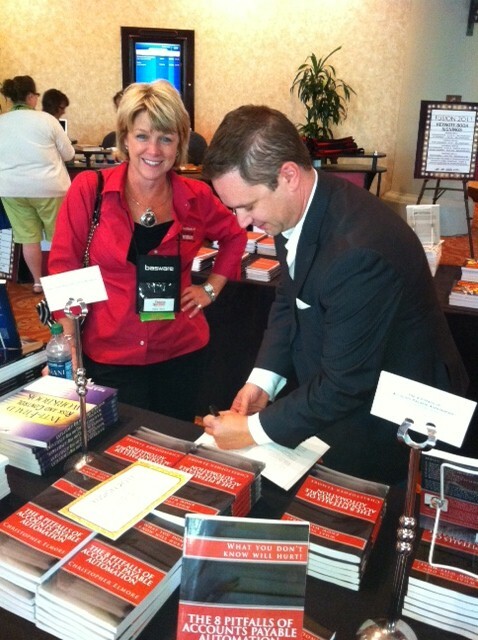 Yes I will sign your book! I explained, I wrote the book to let people know that features are only part of the decision that goes into automation. The other parts are about process, change, and (especially) re-engineering an old process (that has years and years of paper dysfunction) to a modern process. The problem with creating a new modern process is the realm of possibilities is not understood. That is why I wrote the book – to change the understanding of possibilities within Accounts Payable. (After the speech) They would buy… I couldn’t tell if it was because of the speech or because I was standing there… At any rate we sold a lot of books… YEA! This week the party continues. I am on my way to LA to meet with a small group of people who want to know about the 8 Pitfalls. Thanks man – and I will take you advice… how is the new gig?